Hi, everybody! I've been meaning to post this outfit for about a week or two, but my laptop's been having some issues. It is a spring outfit, but for a quite chilly day - hence the boots! 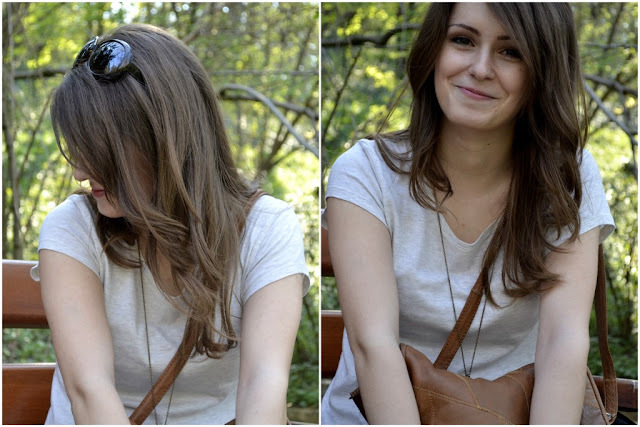 I've had a lovely day with my boyfriend in a nearby park, and we thought we'd grab the camera to shot a few outfit photos. Hope you enjoy this! As you can tell from the description above, I've become quite obsessed with New Yorker..haha! :) They have really great things, or at least I know I can always find something I like in their stores. I've always loved the beige-brown combo, as you might know, and the plum in the cardigan is just a plus for me, cause it adds a bit more color to the outfit. I absolutely love those boots, but now that it's getting warmer I've switched to flats and sandals. Let me know what you think! Thanks for taking the time to read this!